Last week, Kate Headley requested a bouquet for a photo shoot. I was happy to oblige, for the opportunity to have her photograph my bouquets. Kate is the latest superstar in the world of photography. You must check out her website and blog. I did have one huge dilemma, I was leaving on vacation and the cooler was almost empty. I decided to turn the request into a challenge and see what I could come up with by using the bounty of my property. This time of year proved to be a bit difficult, as we are just past the glory of Spring and it is a tad bit early for my annuals. This caused me to get very creative. 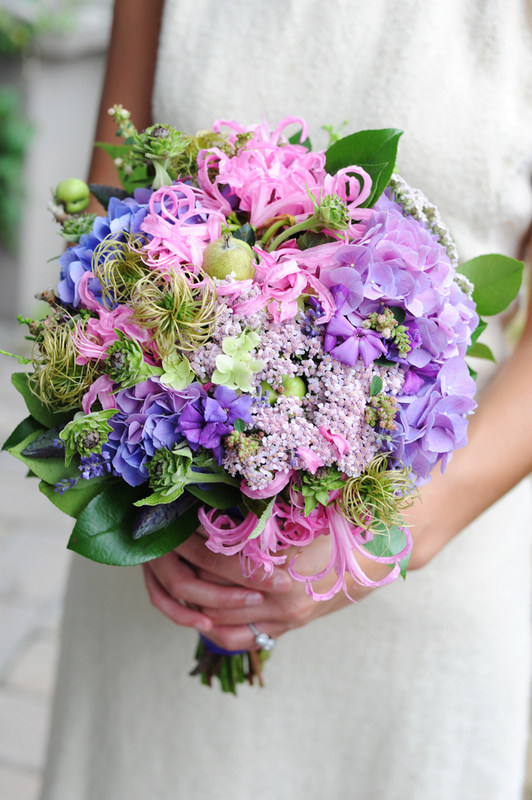 Every flower in this bouquet was from my garden except for the Pink Nerine Lily. I had those chilling in a vase in the cooler. First I hit the apple tree and pulled tiny little baby apples down right on the branch. I used my purple Hydrangea, tiny undeveloped blossoms from some plants my husband started by seed, the pods from my Tulip Poplar tree, pink Yarrow and the remains of my Clematis. The results were honestly stunning, I truly had a ball making this piece. So much fun; that I decided to make just one more bouquet for the fun of it all. I had probably 30 green Carnations leftover from the weekend before, they last forever. I also had some white Freesia that simple was not ripe last week. I usually take my leftovers and donate them to Churches or friends but this week I got to use them for this shoot. I massed the carnations together in a tight ball. I pulled the hydrangea though the cluster and then hit the garden again. 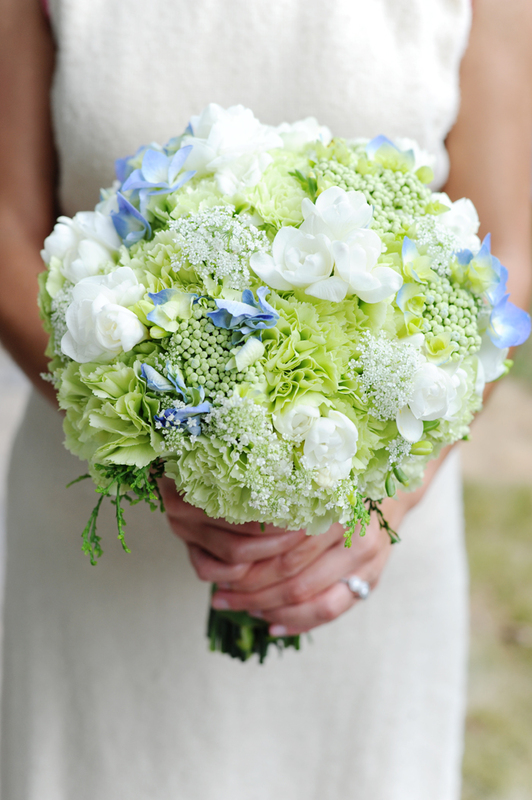 I pulled through the bouquet white Queen Anne's lace, and my blue Lace Cap Hydrangea. 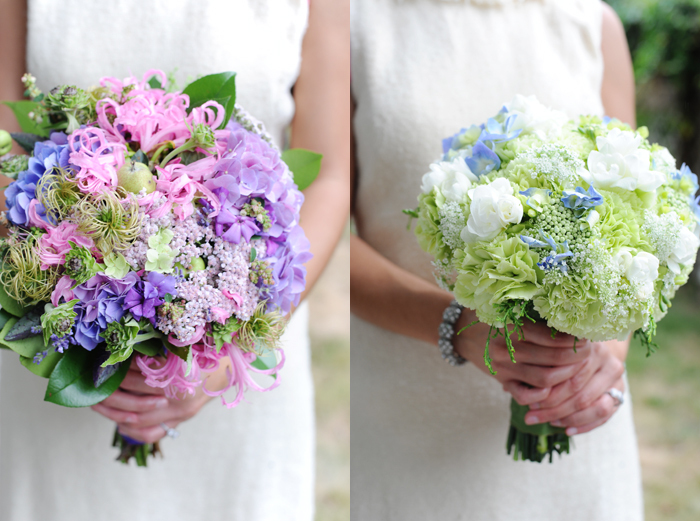 I was so happy to create these bouquets; just for the sake of creation. I had a great time in the garden that morning and it was a little kiss goodbye before I headed off to the beach. Thank you so much Kate for sharing these photographs with me, now I will have my glorious bouquets forever. Gorgeous! I love the dress the bride is wearing…very unique! 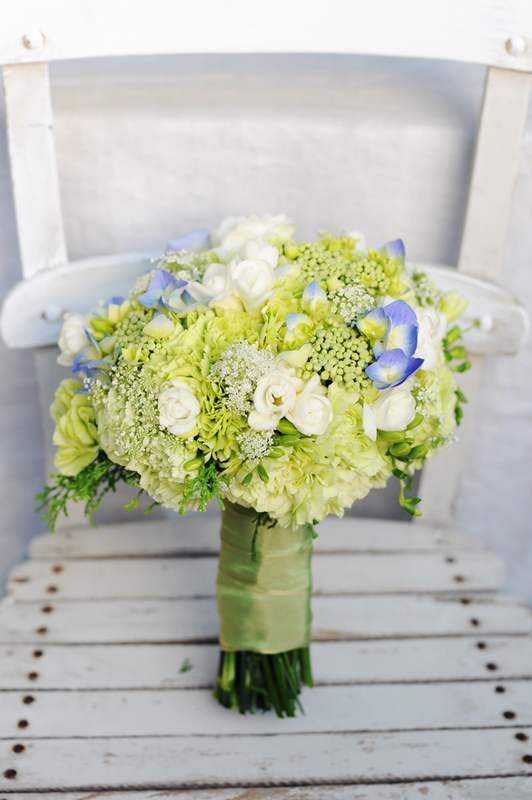 Holly–thanks so much for creating such a gorgeous and eco-friendly bouquet. Your work is pure elegance. Very nice girls, just what I needed to hear. I absolutely love that first bouquet! Just gorgeous!! It is almost your turn Becca.